I wasn’t lucky enough to know Reverend Anderson Bakewell, S. J. 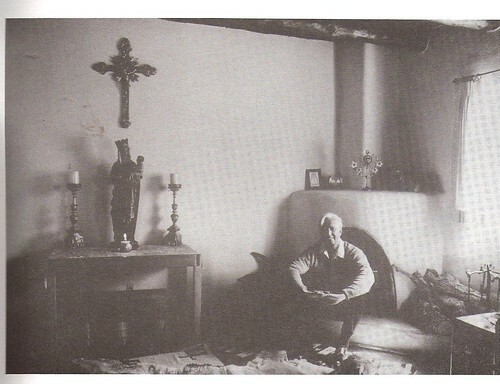 (Society of Jesus) before he died in 1999 at age 86. 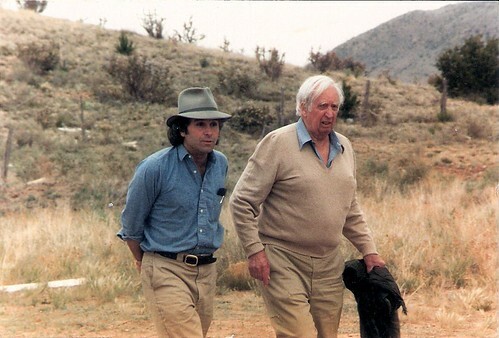 But my friend Steve Bodio knew him well and hunted with him. Hunted? Yes—Bakewell was not your ordinary priest, even for a Jesuit. In the 1930s he collected reptiles and amphibians in Mexico and South America for the St. Louis Zoo (and had several of them named after him). In 1941 he climbed Mt. Wood in the St. Elias Range, at that time the highest unclimbed peak in North America. He went on to be the youngest member of H.W. Tilman’s attempt on Mt. 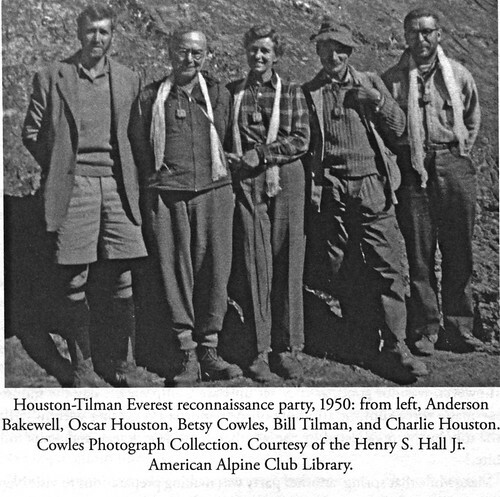 Everest in 1950, the first from the south, which would prove Hillary’s and Norgay’s successful route three years later. In the meantime he earned a bachelor’s degree and did graduate work in astronomy, mathematics, and philosophy. Oh, and in 1942 he entered the Society of Jesus and did missionary work in India (where he helped prepare antivenom for snake bite treatment) and Alaska (where his parish comprised 35,000 square miles). And became a member of the Explorers Club along the way. And compiled a modest arsenal of fine weapons, including a .416 Rigby which a British officer friend got for him for $75 (they go for $20,000 today). Recently Bakewell’s biographer sent Steve a (presumably tongue-in-cheek) clip from a mid-80s Jesuit newsletter in his effects, titled “Jesuit Final Exam.” If you’re familiar with Heinlein’s classic “Specialization is for insects” quote from Time Enough for Love, this will strike you as sort of the same concept . . . on crack. Steve wonders whether, especially given the rifle reference, Bakewell might have had a heavy hand in concocting this. INSTRUCTIONS: Read each question carefully. Answer all questions. Time limit: four hours. Begin immediately. MEDICINE: You have been provided with a razor blade, a piece of gauze, and a bottle of Scotch. Remove your appendix. Do not suture until your work has been inspected. You have fifteen minutes. PUBLIC SPEAKING: Storming the classroom are 2500 riot-crazed aborigines. Calm them. You may use any ancient language except Latin or Greek. BIOLOGY: Create life. Estimate the differences in subsequent human culture if this form of life had developed 500 million years earlier, with special attention to its probable effect on the English parliamentary system. Prove your thesis. MUSIC: Write a piano concerto. Orchestrate and perform it with flute and drum. (You will find a piano under your seat). PSYCHOLOGY: Estimate the sociological problems which might accompany the end of the world. Construct an experiment to test your theory. ENGINEERING: The disassembled parts of a high-powered rifle have been placed in a box on your desk. You will also find an instruction manual, printed in Swahili. In ten minutes a hungry Bengal tiger will be admitted to the room. Take whatever action you feel appropriate. Be prepared to justify your decision. ECONOMICS: Develop a realistic plan for refinancing the national debt. Trace the possible effects of your plan in the following areas: cubism, the Donatist controversy, the wave theory of light. Outline a method for preventing these effects. Criticize this method from all possible points of view, as demonstrated in your answer to the last question. POLITICAL SCIENCE: There is a red telephone on the desk beside you. Start World War III. Report at length on its socio-political effects, if any. EPISTEMOLOGY: Take a position for or against the truth. Prove the validity of your position. PHILOSOPHY: Sketch the development of human thought; estimate its significance. Compare with the development of any other kind of thought. I’ve occasionally mused on how many of Heinlein’s human skills I could claim (at last count I think I was pretty sure about 16, not counting of course “die gallantly,” which no one can claim until it actually happens). But the Jesuit list? Um . . . I could certainly assemble the rifle, even without the instructions. I have a rough concept of the development of human thought, and some pretty good theories as to the sociological problems that would accompany the end of the world. Dung beetles, Sonoran Desert an iPhone video by ConserVentures on Flickr. We frequently see dung beetles diligently working the cow droppings around Ravenrock. Earlier this spring we watched six beetles at one fresh cow patty, madly rolling up dung into perfect spheres and then surprisingly quickly pushing it away with their hind legs, usually two beetles to a ball. But yesterday we found these two just outside the front door to our cottage—and were just enchanted. I need to research what species of dung beetles are here in the Sonoran Desert; it's possible these 2 are in the genus Onthophagus. Has anyone seen any like this before? To describe them as "adorable" seems antithetical to a dung-harvesting insect, but it's true! 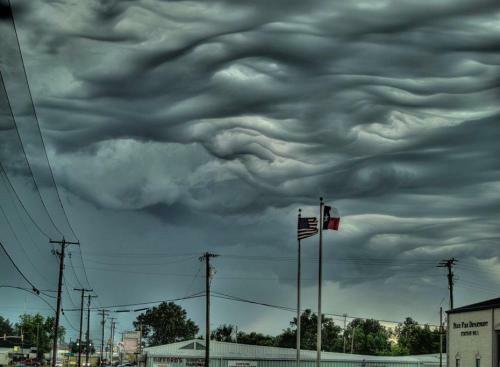 This wonderful image of asperatus clouds was posted on a Tumblr blog "Science You Can Love." Asperatus clouds are so rare they managed to escape classification until 2009. Ominous and stormy as they appear, these clouds often break up rather quickly, without producing a storm. As with most other undulating cloud types, these clouds are formed when turbulent winds or colliding air masses whip up the bottoms of the cloud layer into fancy shapes and formations. More common in the plains of the United States (try Iowa), asperatus clouds are at their weird and swirly best during the morning or midday hours after a thunderstorm. Happy Summer Solstice 2012, a photo by ConserVentures on Flickr. Technically the northern solstice occurred last night at 23:09. A solstice is an astronomical event that happens twice each year as the sun reaches its highest or lowest excursion relative to the celestial equator on the celestial sphere. As a result, on the solstice the sun appears to have reached its highest or lowest annual altitude in the sky above the horizon at local solar noon. The word solstice is derived from the Latin sol (sun) and sistere (to stand still), because at the solstices, the sun stands still in declination; that is, the seasonal movement of the sun's path (as seen from Earth) comes to a stop before reversing direction. The solstices, together with the equinoxes, are connected with the seasons. In many cultures the solstices mark either the beginning or the midpoint of winter and summer. The term solstice can also be used in a broader sense, as the date (day) when this occurs. The day of the solstice is either the longest day of the year (in summer) or the shortest day of the year (in winter) for any place outside of the tropics. 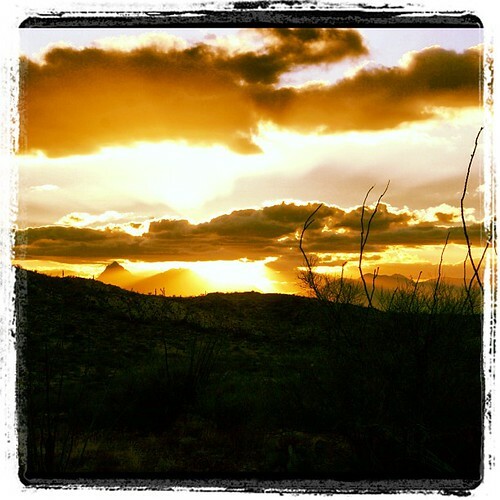 Solstice is one of our favorite times of year—in the heart of the Sonoran Desert it's blazingly hot (106 today), incredibly dry (6% humidity), and often windy. But the black-throated sparrows are singing madly, the summer Anna's hummingbirds are arriving back from California, the nighthawks and elf owls are trilling and peeping all night long—and it means the rains are coming, the desert is ready, the anticipation is palpable. Darwin's notebook, a photo by ConserVentures on Flickr. This image of page 36 of one of Charles Darwin's 1837 journals gives us chills. 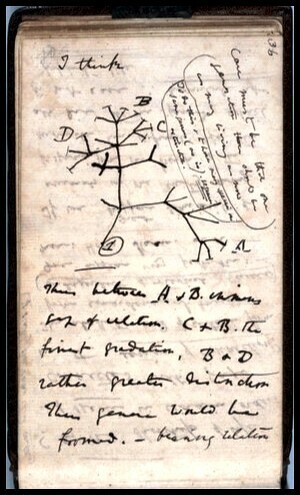 Darwin's notebooks are available online through Darwin-online.org.uk. You can open a notebook and browse the pages as though flipping through them in person. In early June, the New York Times published a story on the Open Tree of Life Project, the goal of which is to draw "a tree of life that includes every known species. A tree, in other words, with about two million branches." 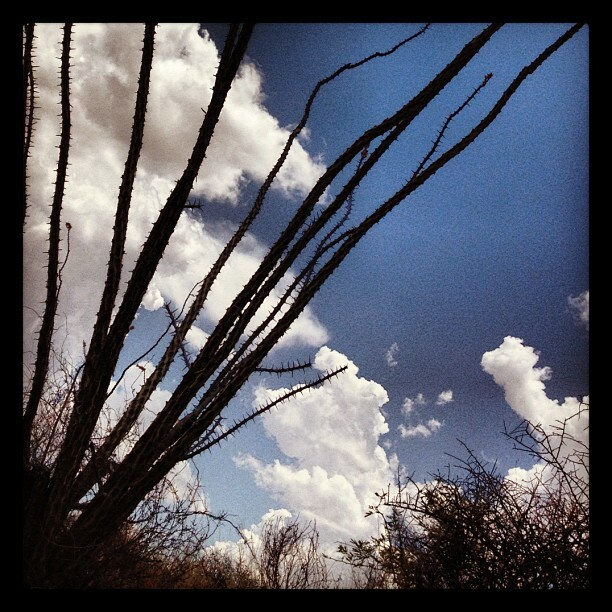 First official day of summer monsoons in the Sonoran Desert (as seen through ocotillo plant). The traditional date for the start is a week away—June 24, or San Juan's Day. 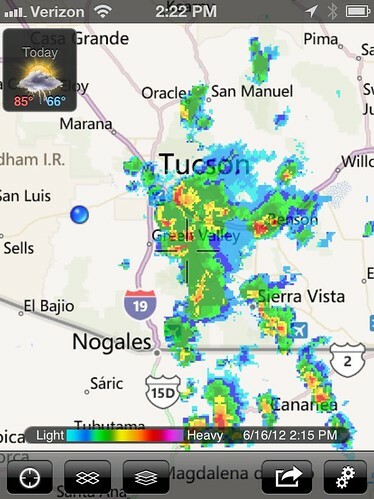 The Arizona Monsoon is a well-defined meteorological event (technically called a meteorological 'singularity') that occurs during the summer throughout the southwest portion of North America. During the winter time, the primary wind flow in Arizona is from the west or northwest—from California and Nevada. As we move into the summer, the winds shift to a southerly or southeasterly direction. Moisture streams northward from the Pacific Ocean and the Gulf of Mexico. This shift produces a radical change in moisture conditions statewide. The movement northward from winter to summer of the huge upper air subtropical high pressure cells, specifically the so-called Bermuda High (H). In addition, the intense heating of the desert creates rising air and surface low pressure (called a thermal low) in the Mohave (L). These two features combine to create strong southerly flow over Arizona. The southerly winds push moisture north-ward from Mexico. The exact source region for the moisture of the Arizona monsoon is unknown. 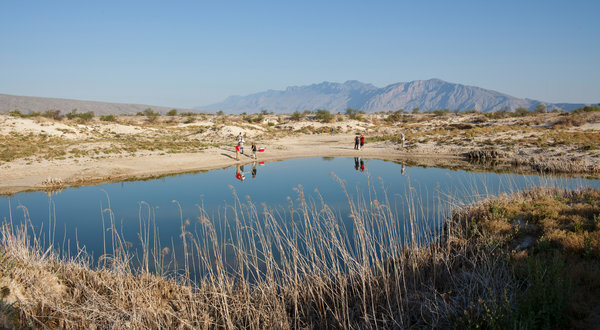 Researchers have proposed the Gulf of Mexico and/or the Gulf of California as the source regions but conclusive evidence has so far been elusive. Here at Ravenrock, black-throated sparrows started singing right on cue as clouds build over the mountains. While today's scientific explorers face physical, intellectual, and financial challenges, their hardships hardly compare with those faced by science pioneers from years past. I recently found this interesting re-posting on Science News on Explorersweb. The question posed is: ""Historical scientists and their importance to society - What moves a person to give up everything in defense of truth?" Profiles include Hypatia (depicted in a painting, above; who ran a library in Alexandria 1400 years ago). A good quick read. With the summer rains come our cavalcade of tortoises. We've seen little ones and really big ones; this young guy, a medium-sized one, was ambling down the trail on our morning walk today (on males you can see the hook on the front of the plastron or belly plate, that is thought to be used during 'combat' with other males for territory; the plastron is also slightly dished, to facilitate mating).